We welcome your opinions and letters  with name and address. We will edit when necessary. Include your name, address and phone number for verification. Mail them to Bay Weekly, 1629 Forest Drive, Annapolis, MD 21403 •E-mail them to [email protected]. or submit your letters on-line by clicking here. I would like to point out one of Bill Burton’s beliefs that has not been mentioned in the many eulogies about him. From 1991, the time of the Rio Earth Summit, Bill has been concerned about global warming. The last time I met with Bill at the annual Burton Picnic on the 2008 Fourth of July, and the last time I talked with him on the phone a few days before his death, he lamented that we were not doing enough to avert this future catastrophe. So I want to credit Bill with concern for the future as well as his active role in present-day affairs. Thank you for such a clever write-up in Bay Weekly (Sept. 3) on the Tools in Motion: Works from the Hechinger Collection now on view at The Mitchell Gallery at St. John’s College. Ms. Martin cleverly conveyed John Hechinger’s spirit in putting together the collection, and it reminds me how much I love tinkering around in hardware stores myself. 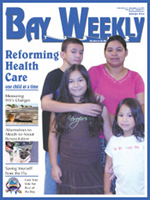 The article was fun to read, and we appreciate the inclusion of our exhibition in this past week’s issue of Bay Weekly! I attended the August 11 Town Hall Meeting in Annapolis. I was impressed with the number of people who came out to support cleanup of the Chesapeake Bay. I feel privileged to have spent my entire life in Anne Arundel County and having the Bay as my source of constant enjoyment: truly the Land of Pleasant Living. It is absolutely unforgivable how we have neglected the Bay so that my sons have never enjoyed swimming in its waters as I did. By the time they were born in 1980 and 1987, I would not risk letting them swim in the Bay or its rivers. A common theme at the Town Hall Meeting was that the laws we have in place are not enforced. How sad that the very developers that profit from our waterfront are willing to ignore any and all attempts to keep our water a valuable asset. This is our moment. We have an unprecedented opportunity for bold action by the federal government. We have a president who believes in the need to improve our environment for the coming generations. The Environmental Protection Agency’s plan, called for by President Obama’s executive order, must move beyond the easily agreed upon voluntary measures that have failed to deliver in the past. The EPA must make increased accountability and enforceable limits on pollution the centerpiece of the plan. States should match federal action with enforceable plans covering non-point source pollution that ensures water quality goals are met. Our state must find the political will to enforce the environmental laws we have. Let’s work together to clean up our Bay and our local environment. To paraphrase Peter Heller [author of Who Will Pay? Coping with Aging Societies, Climate Change and Other Long-Term Fiscal Challenges]: If the Chesapeake Bay dies in our time, we shall have committed a crime so heinous that we shall never be redeemed.